The Holiday season is upon us, and I’m busy decorating our home for Christmas. I usually start right after Remembrance Day (November 11), and take my time to enjoy the process with my girls and do a few seasonal crafts along the way. If you love crafting like me, you might also love my 5 current favourite Christmas DIY ideas that are super easy to make but add a whole lot of festive spirit to your home. Once you’ve found some inspiration for your own Christmas craft session, make sure to head down to the bottom of this post to enter to win $500 from Esurance to continue decorating your home to your heart’s content! 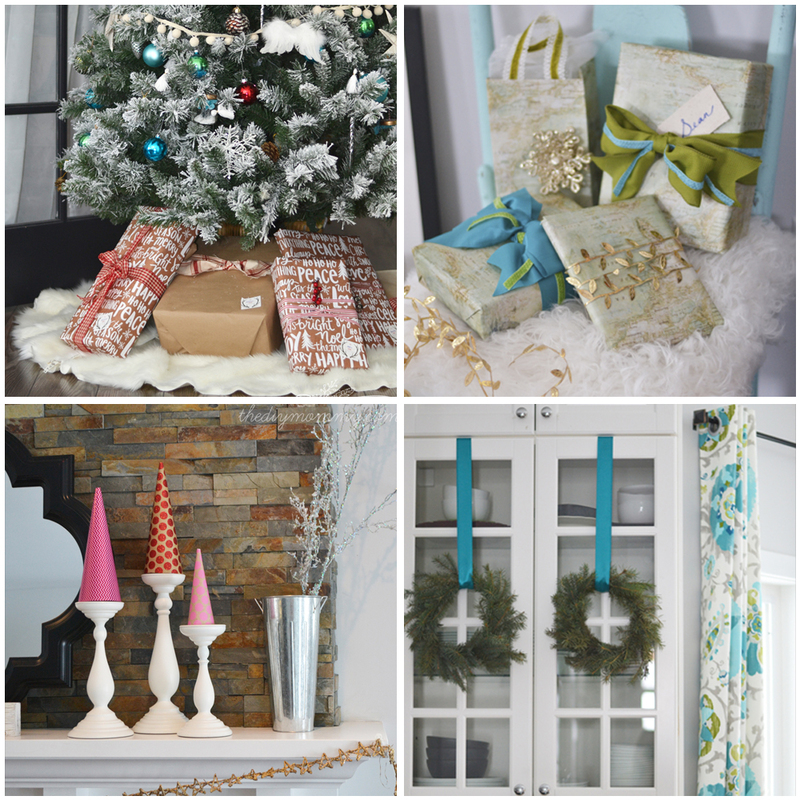 These Christmas decor DIY ideas are some that I’ve used more than once – they’ve stood the test of time and are quick and easy to make. Another DIY you might want to try? Esurance has released a new DIY tool that will help save you money on your home insurance policy: the DIY Home Inspection app. The app is the industry’s first online home inspection tool and you simply follow the instructions as you self-inspect your home to receive a policy discount. Neat, hey? Now make sure to enter to win $500 from Esurance down at the bottom of this post! 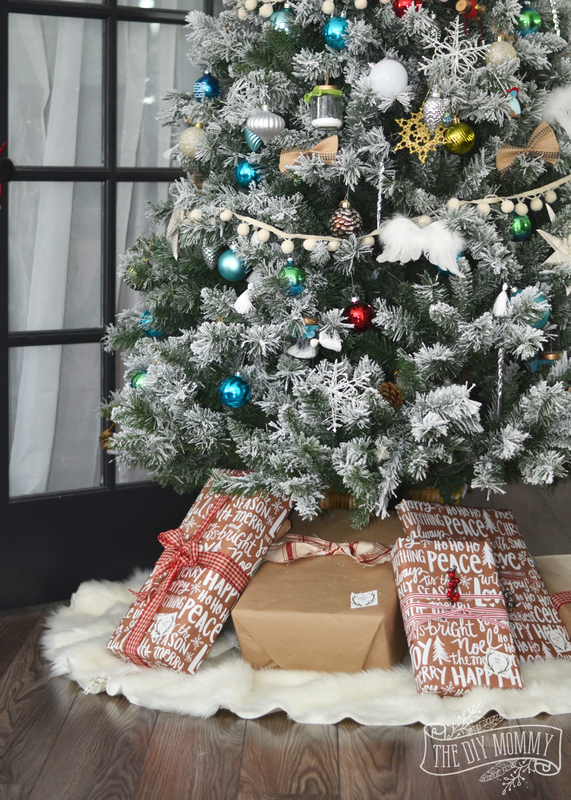 You don’t have to know how to sew to make this ultra-cozy and chic tree skirt! Simply grab some faux fur, a pair of scissors, and follow my directions right here to make your own faux fur Christmas tree skirt. Want something a little more romantic? You can always make my no-sew drop cloth ruffled tree skirt using the tutorial right here! If you have a computer, a printer, and some scraps of your favourite ribbon you can make this beautiful gift wrap from vintage map art. 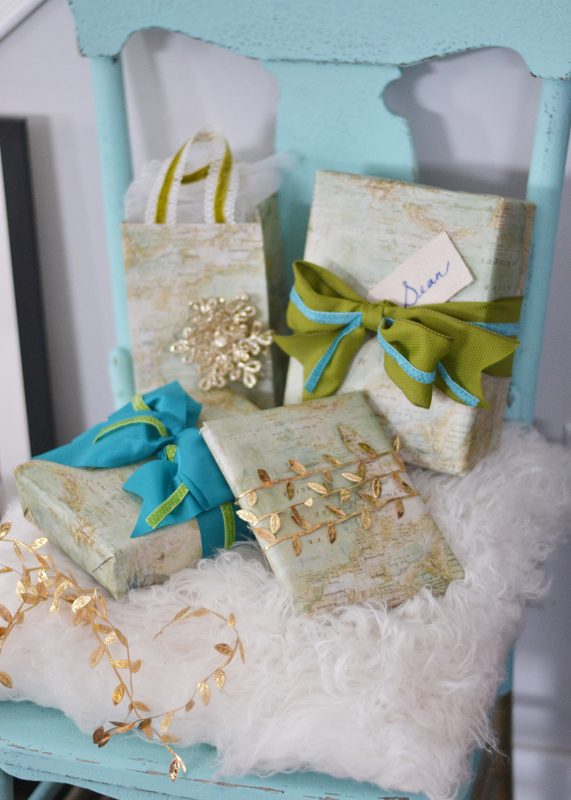 Just head over here to my vintage map gift wrapping tutorial, and you’ll have some beautiful gifts to give and to display in no time. 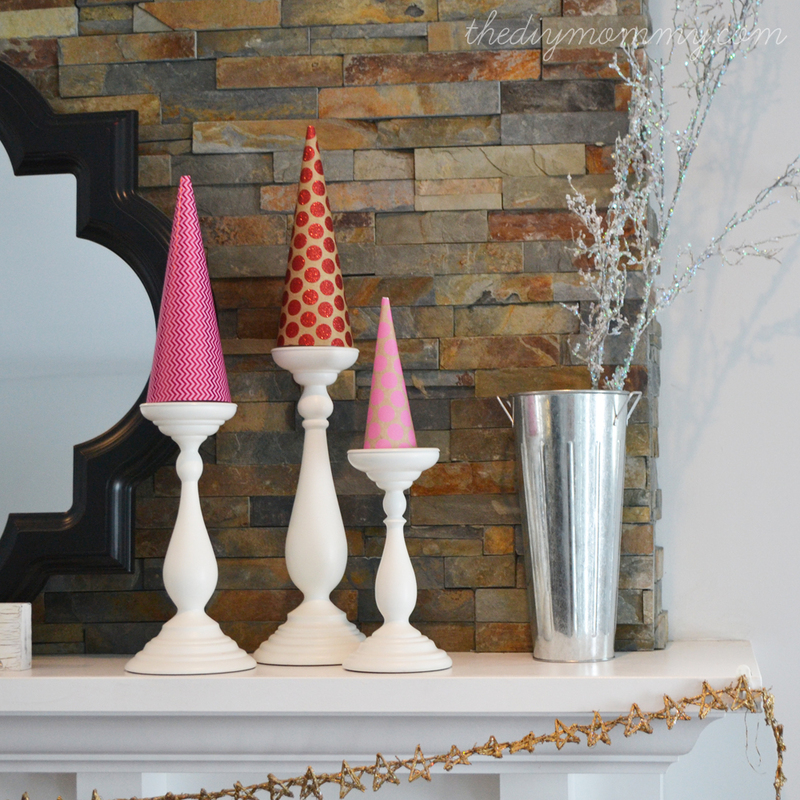 I love these little cones to use as holiday decor on my mantel or tabletop. I’ve made them in festive colours like you see here, or I’ve even recently silver leafed some for a more glamourous look! Visit my Christmas tree cone tutorial here to learn how to easily make these. This craft doubles as a fantastic decor item plus a great kids’ craft! You can recycle small jars and save them for this project. I use epsom salt for the “snow”, and tiny bottle brush trees are usually quite easy to find this time of year. 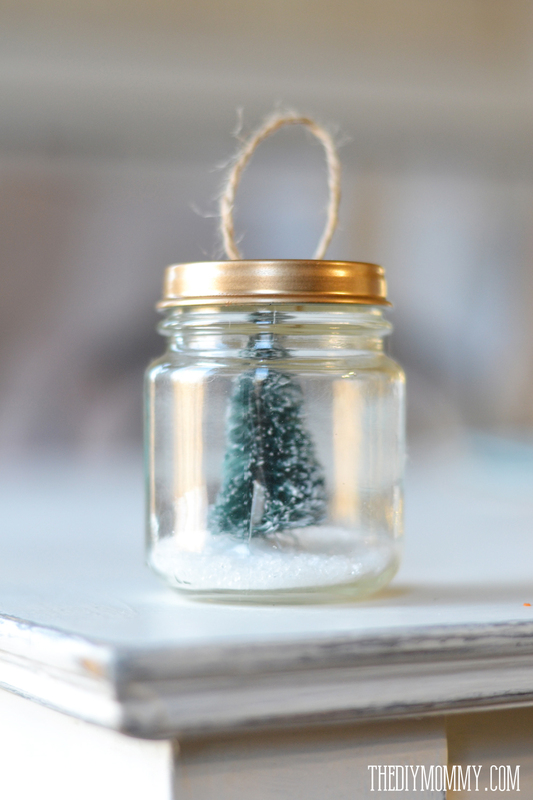 You can learn how to make these cute tree snow globe ornaments right here. One of my absolute favourite crafts to do at Christmas time is to make these beautiful, real evergreen wreaths. My great grandpa taught my mom how to make these, so they’re a really special project that I hope to teach my own girls one day. Not only do real evergreen wreaths look lovely on a mantel or door, but they add a delicious, festive scent to your home. 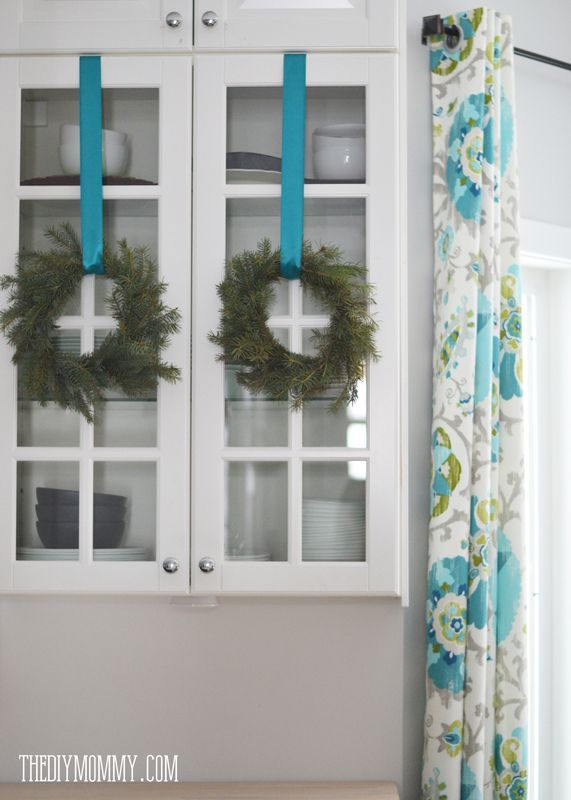 Find out how to make real evergreen wreaths right here. I’m so excited to be able to share with you an exciting giveaway from Esurance! Our homes are special to us, and home insurance helps us protect them and give us peace of mind. Esurance has been in Alberta since early last year offering auto insurance, but as of this fall Albertan homeowners are the first in Canada to have the option of selecting Esurance home insurance. If you’re like me and love to do everything you possibly can online, Esurance is a fabulous option for you. You can manage your policy online, and they work hard to use technology to provide great service. Not only can you save money on your policy with the DIY Home Inspection app, you can also bundle home insurance with auto insurance to save even more. To find a policy that’s right for you, visit Esurance.ca. I would use the giftcard to buy some cabinets for toy storage. I need a few, so even though they aren’t expensive individually, it adds up fast! its all worth it for the kids to have a play room! Paying off bills! Not very exciting, but extremely useful. I’d love to spend it on winter bedding – cozy flannel sheets! I would use it for my family for Christmas and some new paint for me for my bedroom.